Skoda demonstrated its strength in the SUV segment at the Frankfurt Motor Show with three models on display to wow the crowds. 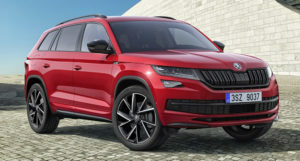 The new Skoda Karoq is an SUV with a unique character. Its emotional and dynamic design with numerous crystalline elements demonstrates the brand’s current SUV design language. The long wheelbase (2,638mm) also guarantees plenty of space for passengers and luggage. With the rear seat in the default position, the boot has a capacity of 521 litres – the largest luggage compartment in its class. The Skoda Karoq also features many ‘Simply Clever’ details, such as the virtual pedal, which opens the boot door with a foot swipe beneath the rear bumper. The optional VarioFlex rear seat solution makes the storage volume variable – between 479 and 588 litres. The VarioFlex system consists of three separate rear seats that can be adjusted individually and completely removed; the compact SUV is then transformed into a van with a maximum load volume of 1,810 litres. It is also the brand’s most digitised vehicle. This is Skoda’s first vehicle with a fully customisable digital instrument cluster. The display can be personalised and linked to the infotainment system. All captive touch displays feature the brand’s characteristic glass design. Thanks to the LTE module and WLAN hotspot that each passenger can connect to, everyone in the Skoda Karoq is always online. Five engine variants with a power output of 115bhp) to 190bhp are available – including three diesel and two petrol engines. Both petrol engines and two of the diesel variants are new to the programme. 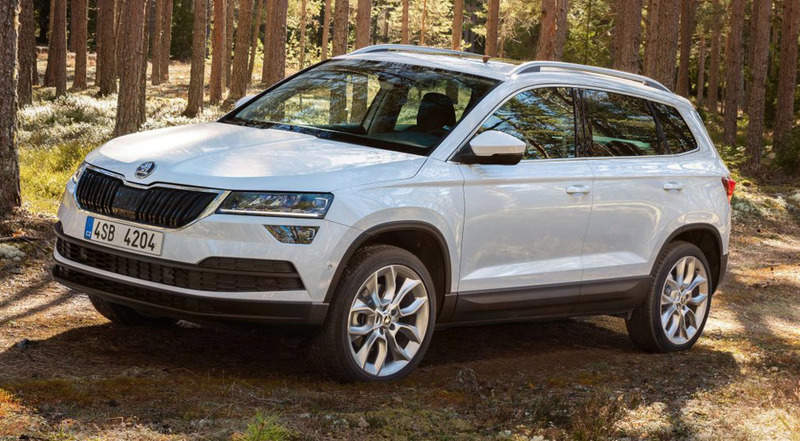 With the Skoda Kodiaq Sportline, the Czech car manufacturer presents a particularly dynamic version of its new large SUV. The series-standard anthracite-coloured 19-inch ‘Triglav’ alloy wheels and the optional 20-inch ‘Vega’ Anthracite alloys characterise the exterior of the dynamic model version. Sporty highlights also include the black grille, black exterior mirrors (electrically adjustable, heated, foldable), door protection strips finished in the car colour, and an individually designed rear bumper. The rear windows are tinted and a black roof rack is available as an option. Also in the black interior, there are many new details and features – such as sports seats with Alcantara upholstery and silver-coloured seams. The stainless steel and aluminium pedals also underline the sporty, dynamic character of the vehicle. In the DSG versions, the multi-function leather steering wheel also has shift paddles. Sportline logos are located on the front mudguards and glove compartment. The central infotainment display of the Skoda Kodiaq Sportline shows the oil and coolant temperatures, acceleration, and boost pressure. The lap timer can also be used to measure the time of each lap. 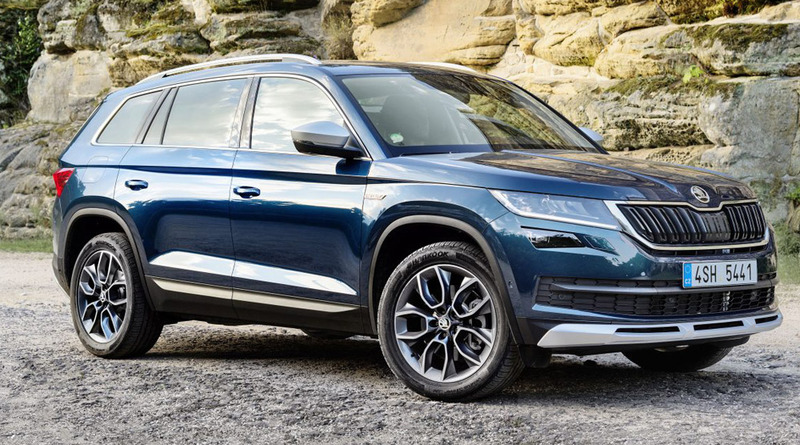 The Skoda Kodiaq Scout also stands out visually and technically from the basic model. It is equipped with all-wheel drive. Details such as the roof rack, exterior mirror casing and the special underbody protection (front and rear) are also in silver and underline the robust appearance of the model. The Alcantara seats in the black interior bear the Scout logo and come as standard along with the door trim in the same material. The four door sill trims feature the Kodiaq logo. The infotainment screen displays the steering angle, compass and altimeter, as well as oil and coolant temperatures. Petrol and diesel engines with outputs ranging from 150bhp to 190bhp are available for the Skoda Karoq Sportline and Scout models.